Ground Plan of the Louisiana Purchase Exposition St. Louis, Mo. 1904. 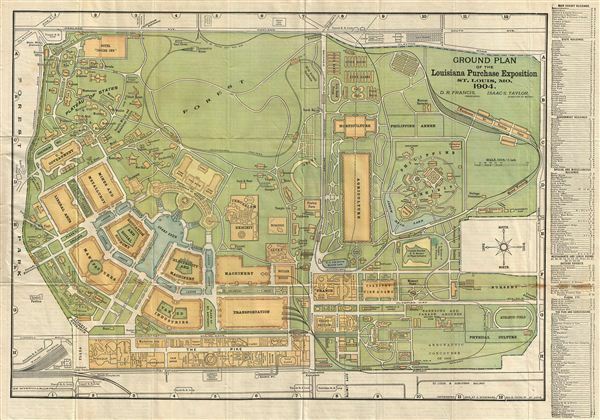 A beautiful example of the 1904 official ground plan of the Louisiana Purchase exposition in St. Louis, Missouri. The map covers the exposition grounds from Forest Park to the Suburban R.R. Loop. The right margin features a list of exhibits, state and government buildings, plazas, etc. The verso offers some interesting local facts and information about hotels, transportation, travel facilities etc. The Louisiana Purchase exposition, spanning 1240 acres and containing over 1500 buildings, was the largest World Fair to date. Over 50 countries and 44 U.S. States participated. The grounds, as shown here, were designed by George Kessler, one of the most influential architects and city planners of his time. The exhibits a human 'zoo' displaying indigenous peoples form newly acquired U.S. territories such as Guam, the Philippines, and Puerto Rico. It is also claimed that such American classics as the hamburger, the hot dog, the waffle style ice cream cone, and Dr. Pepper were first popularized here. The map is colored and folds into a brown cardboard cover titled 'Official Ground Map of the Louisiana Purchase exposition 1904 St. Louis, Mo..' The inside of the cover contains details of the weather in St. Louis printed on the left and hack and cab rates printed on the right. The map is copyrighted 1904, by O. Schrowang, 204, N. Third St., St. Louis. Very good. Multiple minor repairs on foldlines. Verso contains interesting information. Original foldlines.